Full Name Jacob Wiltshire . Jacob Wiltshire was born in 1834 in Vernham Dean, between Newbury and Andover in Hampshire. By 1841 he was living with his parents and siblings at Vernham Dean. In early 1857 he married Hannah Whitbread, and in 1861 they were living at Vernham Bank with their daughter Ellen and Hannah's daughter Alice. 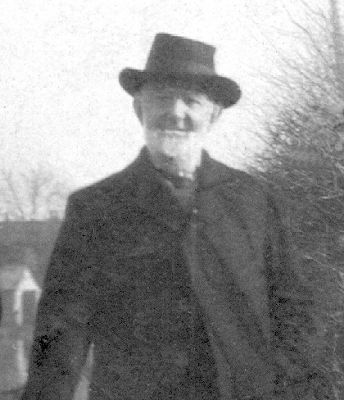 By 1881, Jacob was a grocer's porter, living with his wife and children in West Fields, just southwest of Newbury town centre beside the Kennett and Avon canal. In 1901, he was still in Newbury, living alone in Bartholomew Street at the edge of West Fields, and working as a jobbing gardener. Jacob in about 1900. Jacob with his son Samuel, probably beside the canal in Newbury. .